Marriage is like a cross every human being is bound to carry to his/her own Golgotha no matter the level of perfection of the partner. It's a case of meshing two different people of diverse ideologies, perceptions, backgrounds, behavioural tendencies, motivations, ambitions and others in one. On this note, will a wife that divorces her husband for another man at the occurrence of the slightest altercation or failed promise be called a good wife? 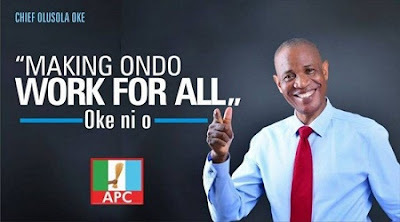 The case of this ‘hireling’ of a wife suffering from an acute deficiency in dignity suits the person of the Alliance for Democracy gubernatorial candidate in Ondo State, Olusola Oke. In making an evaluation of the political career of Chief Olusola Alexander Oke of Ondo State, one is tempted to rhyme his desperation for power with the word ‘corruption’. This assertion is devoid of bias or subjectivity as his history of unprecedented defection over years in his inordinate quest for power and wealth are in public domain. In as much as cross-carpeting in Nigeria isn’t an electoral malfeasance, a politician that jumps ship at the event of a whirlpool is a political jobber and opportunist without a single positive ideology that guides his movements. This is part of the challenges of the Global South where aspiring leaders don’t have a clear-cut leadership ideology. This accounts for why Africa has produced sit-tight leaders that plunder state resources and further impoverish the people after winning their hearts with bombastic electoral promises and non-committal party manifestos. Even when these fortune-seeking leaders pretend to have one, it is marred with the retrogressive ambition of “wealth extraction” from the state (politics) rather than ‘wealth creation” for the state (governance). With due respect to the political warhorse and great lawyer, Oke is like the river passing through the forest. It will certainly and detrimentally pull down trees. Any political party that admits Oke becomes a victim of vicious exploitation and the reality of the true nature of man in a state of nature as postulated by the great political thinker, Thomas Hobbes. Oke’s pedigree in the Ondo political sphere reeks of an ultimate desire to occupy the Alagbaka Government House at all costs even if it means striking an alliance with a terrorist cell to occupy the gubernatorial seat. Oke is an audacious fair-weather man that could be seen chanting the ‘transformation’ slogan of the acclaimed largest political party in Africa - People’s Democratic Party in the morning with the colourful umbrella shielding him from the sun or rain and later be spotted chanting ‘change’ in the evening while wielding a long broom in his hand - sweeping off the foot paths of those that clamoured for transformation earlier on. The Ilaje native could finally be found at the night time in the bed of the Yoruba elders of the Alliance for Democracy, AD easing off the stress of the political activities of the day. Life is like a movie to Oke; so far the price is right, he gets into the desired character whether good or evil. Mr. Oke’s penchant for using groups for his political advantage started in the 80’s during his days with the Ilaje Patriotic Front which metamorphosed from a pressure group to a political group. After Oke achieved fame and gathered influence, he proceeded with a brief romance with the Socialist Democratic Party, SDP from the year 1991 to 1992. He later joined the People’s Democratic Party years as a Legal Adviser where he contested as Governor in 2012 but lost. The defection of Governor Olusegun Mimiko from the Labour Party to the PDP in the year 2014 scuttled Oke’s governorship ambition. 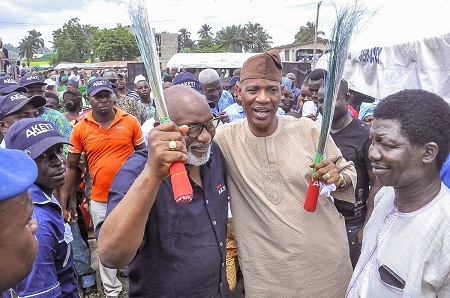 After a cold war with Mimiko, it was clear to Oke that his chances of contesting in the 2016 gubernatorial race in Ondo under the banner of the party will be jeopardized by the Governor, so he decamped after the 2015 presidential election to the All Progressives Congress to selfishly emerge as the sailor of a ship he never constructed. There is a saying that “It’s not the person who changes, it’s the mask that falls off.” Oke’s mask finally fell off amidst speculations that his heart belonged to the PDP. He defected to the Alliance for Democracy, AD after an unsuccessful APC primary election where he successfully cut a deal with the party leadership to substitute his name with that of the party’s governorship candidate, Mr Akin Olowookere as submitted to the Independent National Electoral Commission, INEC. Reports have it that Oke has also teamed up with other aggrieved APC gubernatorial aspirants namely Senator Ajayi Boroffice and the recalcitrant Segun Abraham who was bankrolled by the ‘Lagos Kingmaker’ - Asiwaju Bola Ahmed Tinubu to collapse the APC Ondo structure to suit his governorship ambition under the AD. It will also stun my readers that Oke was initially at loggerheads with Abraham after news filtered in that Tinubu was plotting to impose him as the APC gubernatorial candidate ahead of the primary election. A former APC chieftain, Hon. Bola Ilori has also joined the AD in allegiance to Oke. The masterstroke in this political machination of Oke is that he has garnered the support of some APC bigwigs with the rumoured promise to return to the party as Governor if he wins the November 26 gubernatorial election in the Sunshine State. Imagine such treacherous political calculations from a self-acclaimed Ilaje activist swindling people with lip-service. This is a man that intends to rise to the top by capitalizing on the pains of the people and compounding their despondency. If indeed Oke is an honourable man who has the general interest of Ondo people at heart as he claims for political advantage, he can always align with progressive minds to free the people from the misrule of the PDP rather than him showing a military form of desperation to paddle the canoe without a compass. A vivid picture of Oke was painted by the Ondo APC’s publicity Secretary, Abayomi Adesanya and Senator Tayo Alasoadura who described him as a popular “serial defector and political harlot” in Ondo. “We thank God our party is finally free from pretenders; those who love their ambitions than the good people of Ondo State. We are confident that with the good people of Ondo State behind us, victory is a starting point” he concluded. Dear good people of Ondo State, silver or gold I have not but I sincerely hope my words of truth are shared abundantly among the electorate to orientate them against the political chameleon called Oke. In the face of a depleting federal allocation to the state governments, Oke could ridiculously sell the state to the Chinese people to recoup his political investments over the years and this is more than a joke or hyperbole!